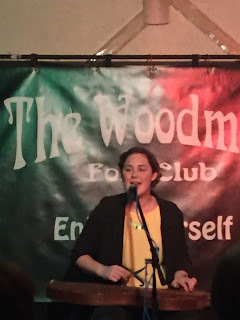 Three Chords and the Truth UK: Kim Lowings and the Greenwood - Woodman Folk Club, Kingswinford. Friday 12th February 2016. Kim Lowings and the Greenwood - Woodman Folk Club, Kingswinford. Friday 12th February 2016. Another year, another new venue and another opportunity to catch up with the music of Kim Lowings and the Greenwood. With that all important second album successfully in the bag, the challenge has been resumed to spread the word within the folk music and wider community. However, not a band to rest on their laurels, we were barely half way through the first set before Kim announced the ongoing writing and recording process with the first live playing of a post-HISTORIA song. This wasn’t the only surprise from Kim’s set list which rolled out to be an even spread from her recorded material, but more of that later. However what has now become a staple given, and far from a surprise, is the sheer quality and delight of listening to so many interesting songs in a live setting over an extended period. The venue this evening was a rare step into the Folk Club world, although the band are regulars in such accommodating places up and down the country. The Woodman Folk Club host their weekly show nights at the point where the suburban Black Country breathes in the rural air and is only a couple of miles from Kim’s home town of Stourbridge. It was easy to detect that the hosts were delighted with the large turnout, cementing the appeal that the band is collating around the area. In line with Folk Club tradition a couple of local acts were given the spotlight preceding both sets, but plenty of time was allowed, probably approaching an hour and half, for Kim Lowings and the Greenwood to breeze through nearly twenty of their songs. Free of the ailments that hindered her on album launch night last October, Kim was in a vibrant mood for this near-hometown gig, engaging in jovial band interaction, clearly keeping the audience informed of her song choice and splendidly showcasing her vocal calibre. 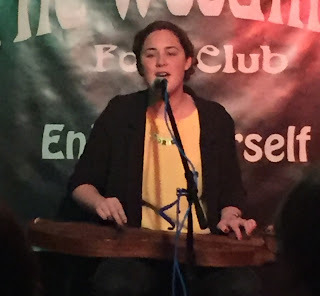 Not afraid to ditch the beloved dulcimer on a couple of occasions, Kim opened her first set by returning to The Be Good Tanyas number she has perfected ‘The Littlest Birds’. This part of the show rolled along with a mixture of traditional and original songs permeated by another interesting cover to match the opener. It was a brave move to carry out a rendition of Joni Mitchell’s ‘Carey’, and somewhat a surprise after seeing a fair number of shows over the last three years. However Kim pulled it off to a tee with that difficult vocal precision commanded. The remainder of the first set saw Kim mainly in familiar territory as she put her own stamp on the old time favourite ‘Dark Eyed Sailor’. This track featured on the new album which also included two self-penned songs ‘Monsoon’ and ‘Maggie’s Song’ that thrilled the audience during this first set. Three other Kim originals made an outing this evening in ‘Phoenix’, ‘Deepest, Darkest Night’ and ‘Off to Sea’. If one highlight was to be picked from the opening forty minutes on stage, the latter song made a very strong case. The remaining song before the break was the new one previewed. ‘Farewell My Love So Dear’ was introduced as a song with German folk origins and bodes well for a future likely to be a continued fresh mix of traditional, originals and smart covers. At this point it is polite to mention the Greenwood stalwarts. Andrew Lowings started off on acoustic guitar before switching to bouzouki for the bulk of the second set with results in perfect tune with the venue’s impressive sound quality. The rhythm duo of Tim Rogers (cajon and cymbals) and Dave Sutherland (double bass and backing vocals) performed their usual stoical backfield roles. Kim’s trademark mountain dulcimer sounded as sweet as ever and apart from the purely vocal start, she reverted to instrument-free mode for a couple of songs in the second set as well. Following the usual break, complete with obligatory raffle, the band bounced back on stage with a couple of traditional favourites in ‘Bonnie Labouring Boy’ and ‘Devil and the Ploughman’. While Kim was in solo vocal mode, she tackled ‘The Allotment’ and gave an interesting insight into the tune ‘In the Spirt of the Rusalkas’, which was one of the few songs not to appear on any of her releases to date. ‘Cuckoo’ and ‘The Wonderful Mr Clarke’ also lack a recorded status but prove regular live numbers. The same can be said of ‘Away Ye Merry Lassies’, a popular audience participation song along with the encore feature ‘The Flounder’ containing a memorable refrain being hummed around the venue. Two of Kim’s softer tunes completed the slightly longer second set in the love song ‘Stay’ and the title says it all, ‘Lullaby’, a beautiful piece of artistry found on the excellent HISTORIA album. Keeping tabs on Kim Lowings and the Greenwood over the last three years has been an entertaining, informative and enjoyable pre-occupation. The relaxed, accomplished and executed performance of their songs, borrowed and owned, tonight easily rivalled and possibly exceeded all previous live listening experiences. So commendation to the Woodman Folk Club for hosting a super evening and for Kim and the guys in continuing to neatly evolve as a band.